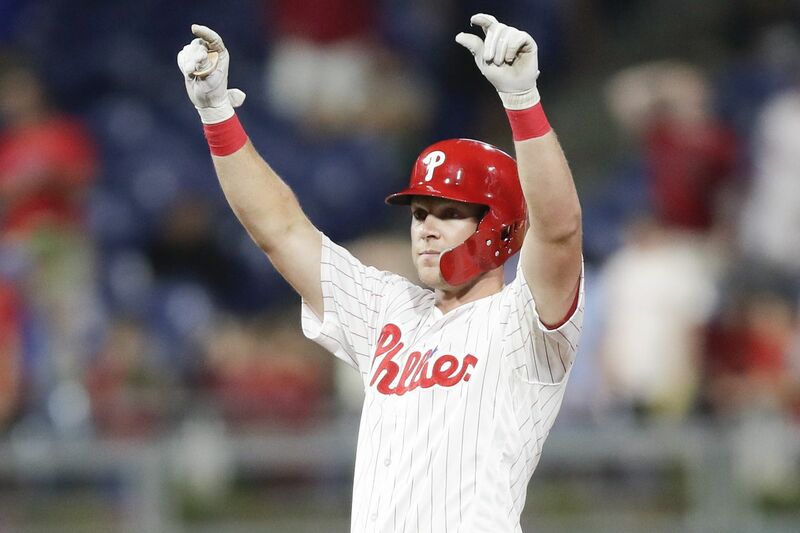 Phillies outfielder Rhys Hoskins raising his arms after hitting a double against the Dodgers last week. The Phillies will celebrate the first day of August with a day off, and it is well deserved as they begin the month in first place for the first time since 2011. Jake Arrieta was excellent Tuesday night, just as Aaron Nola was a night earlier. But the Phils made sure to get enough runs Tuesday so they could leave Fenway Park with a win instead of another punch in the face. They ended July by trading for three players and adding Roman Quinn in the last five days of the month. The Phillies have some needed reinforcements. The final two months should be fun to watch. You probably wouldn't believe me if I told you four months ago when we launched this newsletter on opening day that the Phillies would be in first place on Aug. 1. It's OK because I wouldn't have believed myself, either. I saw 2018 as a year for the Phillies to "be competitive" and 2019 as their year to "contend." But, here we are with two months left in the season and the Phillies are in first place. It's crazy to think that this season would almost be considered a disappointment if the Phillies failed to reach the playoffs. So what do the Phillies have to do to get to the postseason for the first time since 2011? Win 90 games. The Phils have 59 wins through 107 games, which puts them on pace for roughly 89.5 wins. Reaching 90 is in sight. They would need to go 31-24 over the final two months to finish with a 90-72 record. No 87-win National League team has missed the playoffs since the second wild-card was introduced in 2012. The last 90-win team to miss the playoffs from the NL East was the 1993 Expos, two years before the first wild card. Winning 90 games would give the Phillies a solid shot at the postseason. The Phillies will play 28 games against winning teams and 27 against losing teams. To reach 90 wins, the Phillies could go 14-14 against winning teams and 17-10 against the losing teams. That seems doable. They have nine games left against the Nationals and seven against the Braves, the two teams with which they will vie for the division title. And it is their 10 games with the Marlins and 11 with the Mets that could prove the difference. They play the two bottom feeders of the division more often than the Braves and Nationals do. If the Phillies can clean up against the Marlins and Mets, who have given the Phils some trouble, the division would be in reach. That all starts Thursday when the Marlins visit Citizens Bank Park for a four-game series. The race to 90 is on. As De La Soul once said, "Shake, rattle, roll to my magic number." In case you missed it, the trade deadline came Tuesday afternoon and the Phillies made a pair of moves. Scott Lauber breaks it down from Boston as the Phils added all-star catcher Wilson Ramos, who is on the disabled list, and lefthanded specialist Aaron Loup. It wasn't Manny Machado or Bryce Harper, but these small moves could be helpful. The Phillies improved their odds of winning a World Series on Tuesday by making two small moves. Seriously, writes David Murphy. No, not the 2018 World Series. But a future World Series. The Cheese writes a compelling column about how the Phillies treated the trade deadline, and he gives Matt Klentak a stamp of approval. Murphy also hosted a podcast shortly after the trades went down with Scott Lauber and myself chiming in. We're hoping to do podcasts like this more often during the final two months of the season. We hope you enjoy it. Odubel Herrera was out of Tuesday night's lineup, but it had nothing to do with his mishaps from Monday night. Gabe Kapler said Herrera's day off had been planned long in advance, so he would get consecutive days off before the final two months. Today: The first-place Phillies are off. Tomorrow: The Marlins come to town for a four-game series, 7:05 p.m.
Friday: Shane Victorino retires before Phillies-Marlins, 7:05 p.m.
Saturday: Roy Halladay and Pat Gillick join the Wall of Fame, 7:05 p.m.
Sunday: The Phillies salute the 2008 world champions before the series finale, 1:35 p.m.
Phillies manager Gabe Kapler tells everyone what place the Phillies are in as August begins. Wilson Ramos might not join the Phillies until Sept. 1 and there's a lot of baseball to be played before then. But the Phils will be getting quite the lineup addition if they can stay in the race for another month. Ramos had an .834 OPS in his first 315 plate appearances with Tampa Bay. In the last 60 years, the Phillies have had just four catchers — Carlos Ruiz, Mike Lieberthal, Benito Santiago, and Darren Daulton — finish a season with Ramos-like production of a .834 OPS in at least 300 trips to the plate. Answer: Thanks for the question. Hernandez hasn't started a game at shortstop in two years, as he became the full-time second baseman once Chase Utley was traded. I can't see the Phillies moving him back there, as he's too comfortable at second base and I don't think this is the time to try guys at new positions. The Phillies won't have a designated hitter for the rest of the season, which will force Cabrera to play the field. Watch for him to get most of the reps at shortstop while Hernandez stays at second and Kingery goes to the bench or is used in a utility role. The Phillies have to sacrifice defense for offense by playing Cabrera over Kingery and just hope it doesn't bite them.